The golden jubilee celebrations of the establishment of People’s Bank were held under the patronage of President Mahinda Rajapaksa today on 01 July 2011 at Temple Trees. A special 1000 rupee commemorative silver coin produced by the Central Bank was released today to mark the Golden Jubilee of the Bank. Ajith Nivard Cabral, Governor of the Central Bank presented the commemorative coin to the President. Minister of Postal Services Jeevan Kumaratunga presented the Commemoration Stamp and the First Day Cover issued to mark the 50th Anniversary to the President. The Anniversary Souvenir and a book on the 50 years service were also handed over to the President at the ceremony. People’s Bank was inaugurated on 1st July 1961. The first branch was opened at Duke Street, Colombo-01. During the same year, eight more branches were opened at Anuradhapura, Polonnaruwa, Kandy, Matale, Hingurakgoda, Puttalam and Hambantota as well as the Foreign Branch in Colombo. At the end of the first year the total number of employees was less than 200. 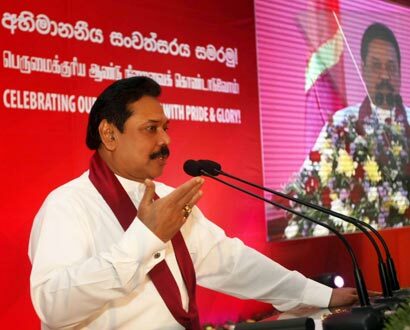 Speaking at the Golden Jubilee Celebrations, President Rajapaksa said that the Peoples Bank should make a determined effort to provide a significant service to suit the next 50 years in this millennium identifying the needs of the people. The President also recalled how the Bank became bankrupt. No one has forgotten the era in which a proposal was floated to sell the Bank. He reminded that no one should forget there are groups of conspirators which are spreading rumors that the country is going towards the bankruptcy and the economy is shattering, he added. Addressing the gathering President Rajapaksa further said that his government considers the present situation prevailing as a strength surpassing an era in which the world economy is facing a crunch and workers being fired out. He noted that he believed that the People’s Bank would receive the necessary strength and courage to serve the public friendlier, efficiently as well as effectively within the next 50 years. Secretary to the Ministry of Finance and Planning, Dr. P.B. Jayasundara and the Chairman of People’s Bank and People’s Leasing Company Limited W. Karunajeewa were among the other speakers. Deputy Minister of Finance and Planning Geethanjana Gunawardana, Defence Secretary Gotabaya Rajapaksa, many Parliamentarians and senior government officials were attended at the Golden Jubilee ceremony. In addition to the main ceremony today at Temple Trees, golden jubilee celebrations were held at all branches island wide, giving priority to religious observances, charity and other social services. On 04 February 2011, Buttala hospital was renovated at a cost of 22 million rupees and declared open to the public to mark the 50th anniversary of the bank. It was the 1st project being completed in this series of events.